Many have bashed Jurassic World: Fallen Kingdom, but I will not. I freely and openly admit that I had a great time watching this film. Jurassic World: Fallen Kingdom is the feel-good comedy of the year, one of the most hilarious films I've seen in a long time. After the events in Jurassic World, the island where the dinosaurs roamed has been abandoned. A previously-dormant volcano has reawakened, threatening the reextinction of these terrible lizards. The world is fiercely debating whether or not to let them die. Those in the 'let them die' side include Dr. Ian Malcolm (Jeff Goldblum). 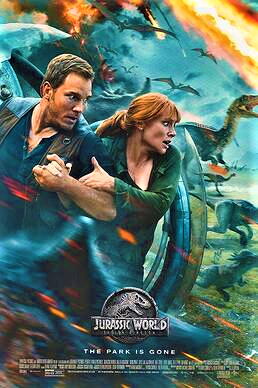 Those on the opposite side include Claire Dearing (Bryce Dallas Howard), who has switched her view since she was the cold Jurassic World lackey. Claire finds an unlikely ally in Eli Mills (Rafe Spall), who works for Benjamin Lockwood (James Cromwell), the hereto secret/silent partner to the late John Hammond. Eli tells Claire that he and Lockwood are going to spirit the dinos away to another island, a true secret sanctuary where they can live in peace. However, they really want to rescue 'Blue', the Velociraptor trained by her former lover, Owen Grady (Chris Pratt). She eventually ropes him in to return to Isla Nublar to attempt a rescue, accompanied by paleovetenarian Zia (Daniella Rivera) and tech guru Franklin Webb (Justice Smith). On the island, they meet 'white hunter' Ken Wheatley (Ted Levine), who is meant to help. Obviously, he doesn't, because the whole thing is a rouse. In reality, Mills plans two nefarious schemes. The first is to auction off the dinos with the help of mad auctioneer Eversoll (Toby Jones) to various evil figures. The second is to use 'Blue' to create a new and more fierce dinosaur named 'The Indoraptor'. This will be done with the help of 'mad scientist' Dr. Wu (B.D. Wong). It's up to Claire, Owen, and the rest of our Scooby Gang, as well with Lockwood's 'granddaughter' Maisie (Isabella Sermon) to stop this madness. I haven't laughed so hard at a movie in a long time, not even at comedies, so Fallen Kingdom was a great deal of fun for me in that it almost plays as a spoof of these action films and sequels to unintended franchises. I kept writing 'hilarious' in my notes, because Fallen Kingdom seems dead-set on making a spectacle of itself. The thing is, the moments that made me burst out laughing repeatedly were meant to be serious or moving or frightening. Instead, under the direction of J.A. Bayona from Colin Trevorrow and Derek Connolly's script, these moments were just so wildly tone-deaf in how they ended up looking. My fellow reviewer Sarah pointed out one of the (most unintended) funniest scenes, which also had me burst out laughing despite my first effort to keep my laughs from being audible. I even did a little wave and said, "Bye-bye!" at this moment, but there is a cacophony of hilarity coursing through Fallen Kingdom. Right from the beginning when there's a raid on the island to take a bone involving a 'dino-fish', Fallen Kingdom just keeps building up the hilarity factor. There's when Claire sadly says, "They're going to die and no one cares". There's where Zia looks at a giant brontosaurus and says, with tears welling up in her eyes, "I never thought I'd see one in real life". There's when during Claire and Franklin's desperate escape from both lava and a dinosaur, Claire shouts "CHAIR!" to scaredy-cat Franklin. There's Owen rolling away from the fast-flowing lava. There's the entire 'escape from exploding island'. Toby Jones is a laugh-riot from his first appearance; apparently Bayona directed him to have a permanent sneer that screamed "EVIL". From the moment his sleazy auctioneer showed up to his death at the hands of the Indoraptor, I simply could not stop laughing at how hilarious he was. Same goes for Levine, who played his 'white hunter' bit as if he meant it to be a parody. It makes his end, as his cap gets blown off by a dinosaur's snort & him screaming like Maisie all the more hilarious. Even Spall, an actor I genuinely like and who was about the only good thing in Founding Fathers Assemble (aka History's miniseries Sons of Liberty) couldn't help hamming it up as the EVIL aide. Goldblum was on auto-pilot, but at least was spared the embarrassment of having to share scenes with a weak Howard. I think Pratt is a great action star, but am not convinced he's an actor yet. I think he did his best, but when he rolls away from the lava or outruns dinosaurs and not just survives a 90+-foot fall off a cliff but looks more beautiful than when he leaped...it's hard not to laugh. Pineda and Smith were essentially nonentities in this, though to be fair Smith was the worst of the two. I figure his thin character was meant to be either actual comic relief or the 'everyman' caught in this, but his constant frights came across as annoying. I would have preferred he be the one eaten than Mills. The story is total nonsense. The idea that Lockwood's estate could hold this 'mad auction' is already daft, but the idea that these dinosaurs could sell for a mere $4 million to $37 million for this 'Indoraptor' is just idiotic. For comparison, Salvator Mundi, reputed to be a 'lost' DaVinci painting, sold for $450 million. Am I seriously expected to believe that a painting whose origin is still in dispute would sell for more than a living dinosaur? Michael Giacchino's score does what no score should do: announce itself and the moods. It thunders 'danger' when they arrive on the island or 'menace' when we conveniently overhear Mills and Wu discuss their plans for Maisie's ears. While many have commented positively on the extended dino-chase in the Lockwood mansion, I just wondered why Maisie thought literally hiding under the covers would save her from a dinosaur that could track her down (or how such a large creature could fit in there). Despite how awful to silly Fallen Kingdom is, and it is, I still found myself enjoying it for its sheer awfulness, one of those 'so bad it's good' films. It tries so hard to be exciting, even moving, when it ends up being a spoof in all but name. I loved that it made me laugh without meaning to. That being the case, how I can bash Jurassic World: Fallen Kingdom when its so wacky and wonderful in its sheer inanity? I digress to point out that Chris Pratt was 14 years old when Jurassic Park was released, and I'm sure neither of us thought he would be part of this expansive cinematic universe. I look forward to seeing this film played repeatedly on FX or TNT, hopefully finding more things to laugh at.